With content marketing quickly taking over the world of marketing, it’s no wonder content strategy and integration has become more and more crucial to businesses. But what makes up a content marketing strategy? And more importantly, how do you go about creating a well-rounded, fully-integrated content strategy? No need to worry, that’s what this article is for! I’ll walk you through the basics of content strategy, starting at the very beginning by answering the simple (or not so simple) question, “What is a content strategy?” and then showing you a high-level approach to creating your very own content strategy. Ready? Let’s get started. If you perform a google search for “what is a content strategy?”, the results come back with a long list of varying definitions. However, after working in the content department at the Phoenix based advertising agency, Zion & Zion for over two years, I can honestly say that there is much more to content strategy than “planning, development, and management of content” per Wikipedia’s definition. A content strategy combines the research, unearthing, development, implementation, integration and management of all written and visual content for a brand to use in order to educate, excite and guide users (i.e. potential customers) through the conversion funnel. Before you can start developing content, whether it be a blog post, video, infographic, or something else entirely, you need to first research the brand you’ll be creating this content for. Discover what makes the brand unique, then, discover what makes the brand similar to its competitors. Who are the brand’s competitors? What are those competitors doing well? What are they doing poorly? Continue doing your research until you understand the brand inside and out. If you’ll be creating content for the brand, you need to know it like the back of your hand. At Zion & Zion, we use a variety of tools when it comes to the early steps of creating a content marketing strategy. Below are a few of my personal favorites! As you may have guessed, Google Analytics is a great source for anything website based. I always start here to determine which pages on the site are getting the most traffic. While not a guarantee, this can be a solid jumping off point to determine which information your current users are most interested in. Within Google Analytics, you can also view organic searches that led to a user landing on your site (though with somewhat recent Google algorithm updates, the majority of these searches now come back as “not provided” leaving us with, unfortunately, much less information than in recent years). 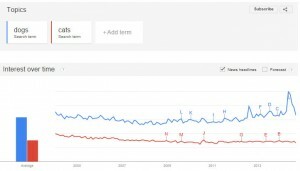 Google Trends is a free tool that allows you to compare various search terms to see how they are trending in comparison to one another. I use this tool extremely often—from the broad to the specific, Google Trends can really help you out! For example, you can compare broad terms, such as “dogs” and “cats”, against one another to see which animal is trending higher on the internet. Once you choose the terms you’d like to compare (you can add up to five), depending on how generic or specific your terms are, you can then dive deeper by filtering by year(s) and location. If your terms are too specific or too long, you risk receiving zero results. 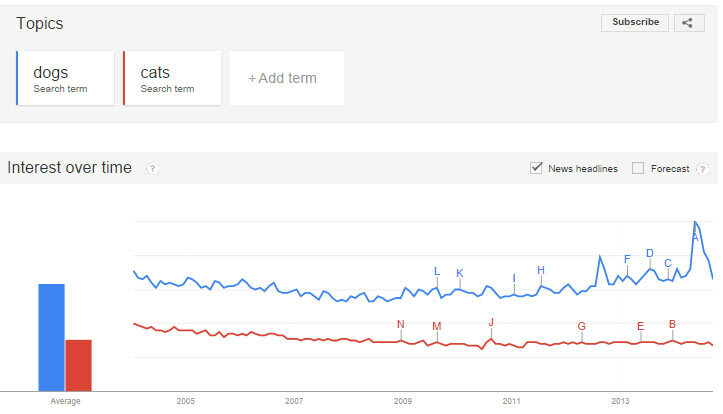 You can see in my example that “dogs” is trending much higher than “cats” and has been for years. This is obviously a very simple example, but Google Trends can be used for any and all topics, and because it is free and easy to use, there is no excuse for not running your ideas through it before committing to anything. Often overlooked, by performing a basic google search for your brand, topic or potential title of a piece of content, and then scrolling to the bottom of the SERP (search engine results page), you’ll be presented with “Searches related to (your search here).” Doing this will provide you with some insight as to what other popular searches related to your original search include. 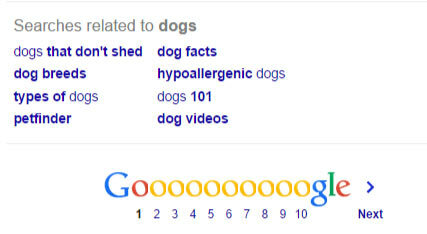 You can see that by searching for “dogs,” I am presented with some of the more popular and related topics. This can be a great source for finding new topics that may be of interest to your customers. For example, if you are a flooring company who’s on all of the main social media platforms, in addition to having a blog on your website, then written content in the form of blogs, visuals in the form of photography and custom infographics, and branded videos may make the most sense! Once you’ve determined the types of content you’ll be developing and how often you’ll be posting, I recommend creating a content calendar to stay organized. You can create your content calendar in whichever program you’d like, but I prefer starting in an Excel spreadsheet. I create one tab that resembles an actual calendar, and a second tab with all content pieces listed out, including the type of content, due date, publish date, additional notes, etc. To keep everything in one place, you can even create a third tab that is used for jotting down future notes and ideas. I know… I am a big fan of post-it notes too, but believe me when I say that Excel works better! Finally, the time has come for you to start developing the actual content! This part is pretty straightforward. For visuals, you’ll want a designer handy, for blog posts, you’ll want a skilled writer, for video, you’ll obviously want a video editor. While everyone gets to work, it’s up to the content strategist to ensure that all of the pieces work together rather than work against each other. Keeping the voice, brand and messaging consistent is crucial, as it’s more than likely your users will be exposed to multiple pieces of content. Now that you’ve created and implemented your content, it’s time to start integrating it into the various platforms and mediums. Keeping with our flooring company example, let’s say that you have four blog posts written, approved and ready to go. Each blog post has a complementary custom infographic to go along with it. Instead of posting these onto the website’s blog and calling it a day, you should think of where else this content can be repurposed. Blog posts can make great social media posts and even better email newsletter content! Work with your social media and email marketing teams to repurpose this content. So now you know what it takes to implement a basic content marketing strategy! But that’s not all. Consistency and thinking long term are key when it comes to content. Sure, the topics and campaigns can change, and in fact, they should change! But if you are determined to have a successful ongoing and long-term content strategy in place, then you have to be in it for the long haul! We understand that all clients are unique, so we are constantly strategizing the perfect plan for each client, whether it be a straightforward Tips & Tricks blog that provides current users with helpful information while also driving more organic traffic to the site, or something more integrated that incorporates custom video, infographics, email marketing, blogging and social media all together into a relevant, consistent and ongoing campaign. Given that Zion & Zion is a content marketing agency as well as a full-service, integrated advertising agency, we are able to do everything, yes, we mean everything, in-house, relieving you of any extra (unnecessary) work and stress!